Oxygen values of less than 1/10% (one tenth of of one percent) are achievable with cycle times of only a few seconds. 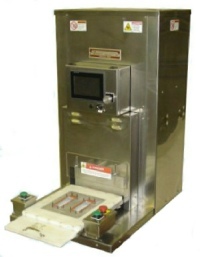 The Modified Atmosphere Packaging system is supplied complete with connections for Nitrogen, or other purge/flood media for the blister heat sealer. Self contained positive displacement pumping system in the blister sealer supplies vacuum capacities, while a vacuum oscillation circuit reduces the package content. Cycle options provide for theoretical oxygen values of 2.25% to below .1% O2. Partial vacuum or balance atmospheric sealing is accomplished through on-board regulation. Full networking is also available. Optional on-board vision completes the system to fully document product loading in the blister tray, batch/lot documentation as well as quality reporting throughout the medical tray packaging run. Please contact us for price quotes and detailed specifications for vacuum sealing, gas flush, nitrogen flushing equipment. Vacuum Blister sealer and Modified Atmosphere Packaging tray heat sealers for medical packaging. This validatable blister heat sealer is designed for medical products packaged in thermoform trays that need a low oxygen atmosphere. Gas flush blister packaging sealing includes gas purge/flush, full vacuum packaging, and modified atmospheric oxygen ‘free’ environments. Packaging in dry Nitrogen blanket is a typical example. Vacuum tray sealing and Modified Atmosphere Packaging option can be added to medical validatable blister sealers for gas flush packaging of blister trays .